Welcome to my second post about the miniatures of The Terror of the Lichemaster, a Warhammer 2nd edition campaign released in 1986. My first post detailed the Lichemaster himself. 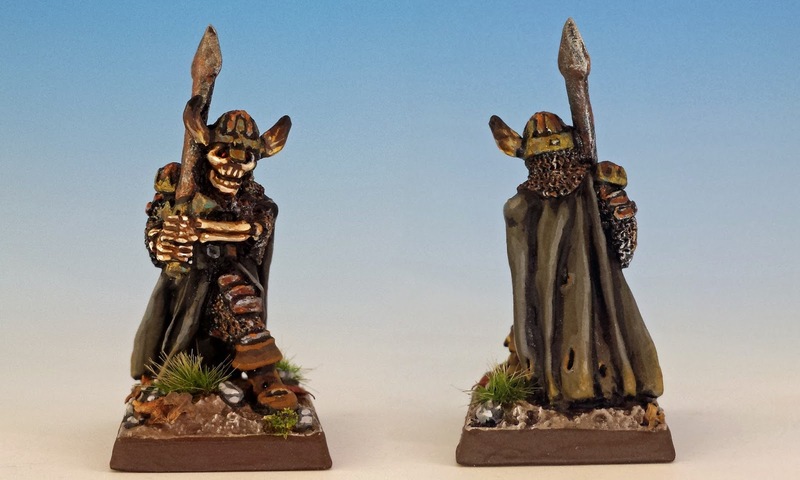 Today I want to take a closer look at some of skeletal minions...specifically Ranlac the Black and Lord Krell. 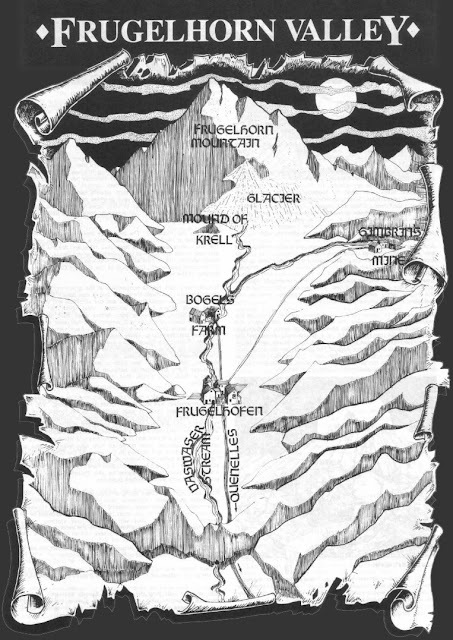 Starting from the burial mound of Krell at the foot of the Frugelhorn Mountain, the Lichemaster divides his forces and creeps south so that he can simultaneously fall upon the two nearby settlements,Gimbrin's Mine (the 1st battle) and the Bogel's farmstead (the 2nd battle). By picking off these isolated victims, the Lichemaster will gain new undead soldiers and prevent any warning from arriving at the Village of Frugelhofen at the very bottom of the valley. Then he will reunite his army and crush the village with its paltry defenders (the 3rd and final battle). Ranlac the Black is the first of the Lichemaster's lieutenants that he dispatches down the valley. He is tasked with killing the dwarves at Gimbrin's mine. 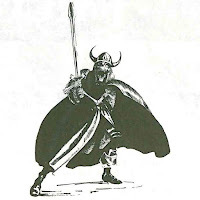 We are told that Ranlac is captain of Krell's guards, "more cruel in death than even in life." He's an Undead Champion and 20 Skeleton warriors are under his command. Ranlac's miniature started life as an unnamed Citadel C17 Skeleton sculpted in 1984 by Michael and Alan Perry. This is a pre-slotta (aka solid base) miniatures of a very high caliber -- great detail and lots of character, thanks to the Perry Bros. I particularly like his flowing robes and samurai-like sword. When I came to paint Ranlac, I wanted to keep the general palate dark and sombre. There's nothing I abhor more than a gaudy skeleton. But his shield demanded special attention, what with its tortured face. After trying several colour schemes and painting over them in disgust, I finally hit on a scheme I liked. I used a rusty metallic as background for a yellow crescent moon. It's just enough colour to grab the eye without being too flashy. And to my eye, it seems to create an unsettling dual aspect to the shield, where you can see two different faces peering out of the same features. The Lichemaster's most powerful ally is Lord Krell. He is described in Terror of the Lichemaster as "a bony horror" carrying "an evil weapon that had sent a thousand screaming souls to the chaos hells." In life he was a powerful Chaos Warrior and in death he binds Kemler to the Ruinous Powers in a dark pact. Within the game, he is a Major Undead Hero armed with a Magic Two-Handed Sword with Warp Attack and Degeneration Strike. Nasty. 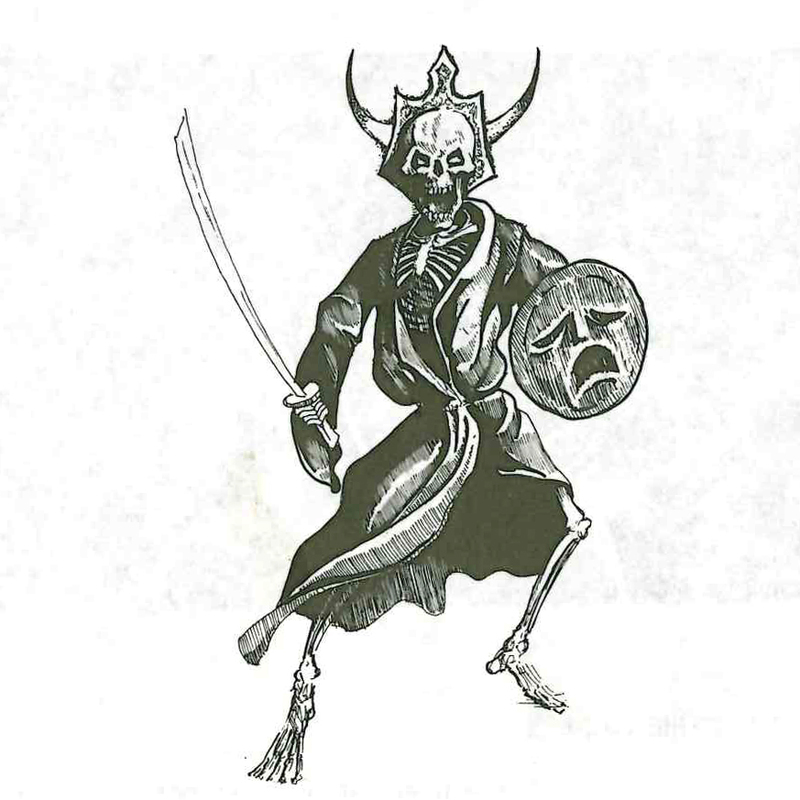 Like Ranlac, Krell was originally a preslotta Citadel C17 Skeleton (1984) sculpted by Michael and Alan Perry. 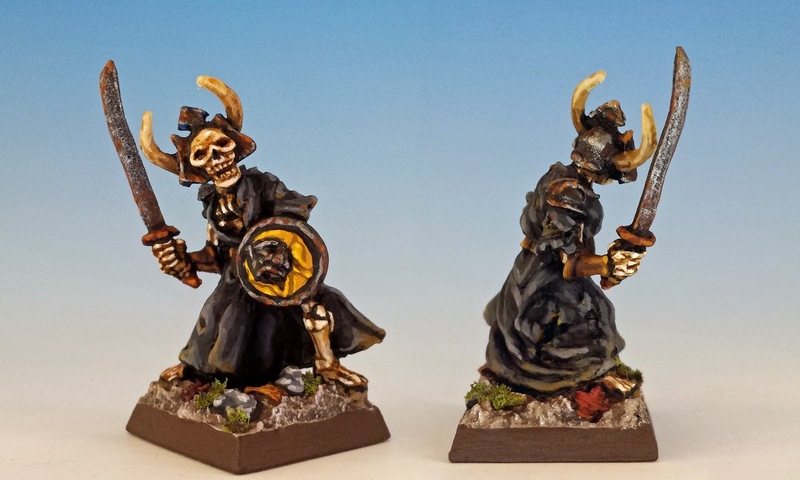 Because they were not specially produced for Terror of the Lichemaster, these two skeleton champions are slightly easier to find than the miniatures that were only created for the scenario and sold by mail-order (e.g. Heinrich Kemler or Gimbrin Finehelm). Again, I kept my colours on the muted side for Krell. I tried to create visual interest mainly through the rust on his armour, and the dirt and decay on his robes. Krell is not looking to win a beauty contest. 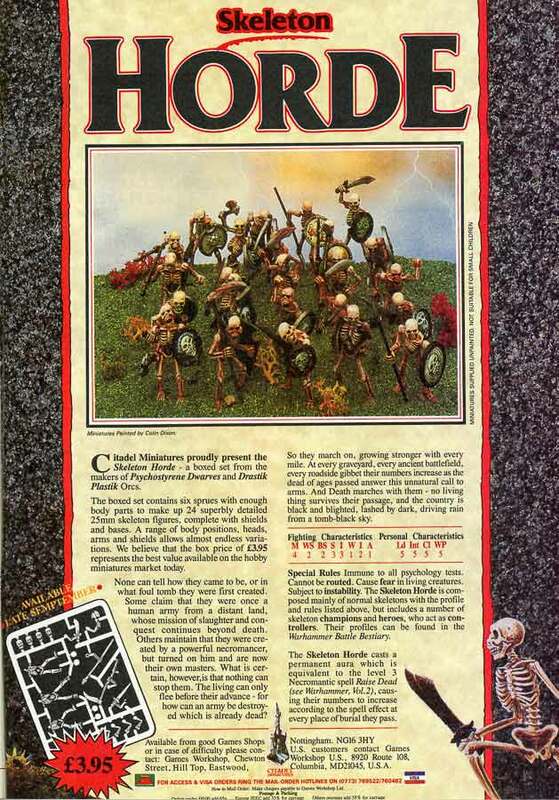 His skeleton minions are all from Citadel's boxed set of plastic sprues, the Skeleton Horde (1986). 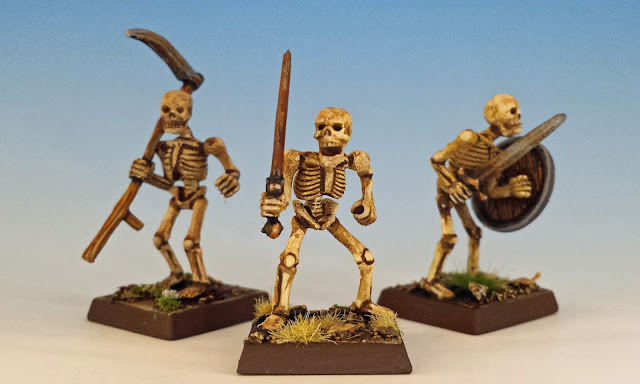 To my mind, these are the greatest plastic skeletons ever produced: they are well-proportioned, simple and easy to customize. My paint job on these undead is as simple as pouring piss out of a boot. I use a basecoat of bone-white, followed by a wash or two of brown ink diluted 50:50 with water. The tips of the bones get a rough highlight with more bone-white, and deep joints get an outline of charred brown. It's the speediest of speed painting. 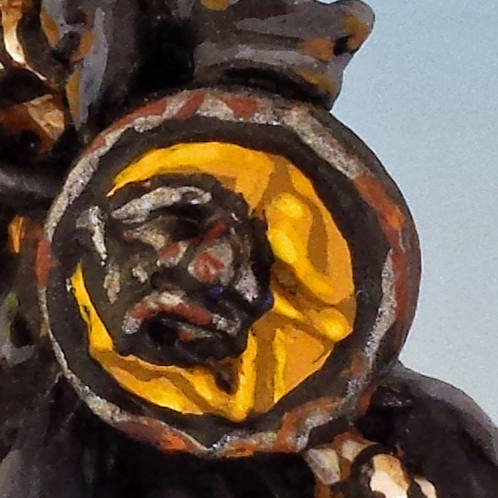 In my next posts, I'll set out Ranlac's prey... the dwarf Gimbrin Finehelm and his small band of doughty followers. Great post with fantastic classic miniatures! Thank You, once again Matthew! Wonderful painting and terrific classic minis. Everybody loves Terror of the Lichemaster. Thanks for sharing! Who couldn't love the Lichemaster?! Great paint jobs again! 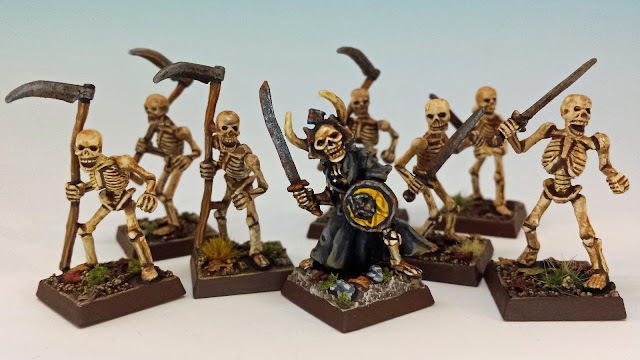 I have to agree with you, the original Skeleton Horde/Skeleton Army plastic skeletons are the best out there. I wish they were still being produced, they are near impossible to find in an unassembled state without taking out a second mortgage. Wish I’d bought a few more army boxes back in the day. Keep up the great posts. I think the price of the Skeleton Horde has really climbed in the last few years. I got my sprues for not too much about 4 years ago, but now they are out of control. I guess it really does show that there's not a similar product on the market right now. Those are some lovely skeletons. Thanks for the tip! Good luck on eBay, Suber. I hope your bank account will forgive me. The later Krell is also pretty cool. The original version is not particularly flashy, but he does sort of look like he just climbed out of a sarcophagus. Excellent work, Ranlac's sword really looks like it came out of a burial mound and had most of the rust knocked off through use. Every time I've looked at these pics, I keep coming back to his sword! I am so glad to hear that the rust looks good! Thanks Andrew. It's an excellent scenario, one I'd love to play, especially if your beautifully painted miniatures were involved. I can't wait to someday mount a game of the Lichemaster. A very interesting read with some awesome miniatures. Thanks for stopping by, Piotr! I hope you do... These old undead rock!